Icemule now makes an insulated cooler + backpack + dry bag in one: The Icemule Pro Cooler! Compared to the Icemule Cooler Bag, this one features comfortable backpack straps. How is the Icemule Pro Different from Other Cooler Backpacks? 1. This Backpack Cooler Chills for up to 24 Hours! Just like the single-strap Icemule cooler, the “Pro” has waterproof seams and can keep the interior contents cold for up to 24 hours. In other words, you can use it for much longer than most backpack coolers and still have ice-cold drinks. How Does the Insulation Work? Icemule uses their unique high-performance PolarLayer™ Insulation foam. In addition, the insulation layer has an “AirValve” that lets you add air to increase the insulation capabilities. And by the way, it floats too. As you’d expect, this rugged, high-capacity cooler backpack is designed for outdoor adventures. Think river rafting, fishing, backpacking, boating, camping, paddleboarding and more. That said, the backpack straps and larger capacity make it a great cooler for beach picnics, tailgaters, soccer games, etc.. You don’t have to hassle with a dripping cooler bag, nor do you have to worry about your drinks and food getting warm. Whether you need a portable cooler, a heavy-duty backpack or a dry bag, you can use the Icemule for all 3! No need to get 3 different bags. Save yourself some money! Plus, as you can see, this pack is built to last, even if you use it every weekend. The video review below shows how large the bag actually is and how it works. Also, you can really see the quality of the backpack straps and bag construction. 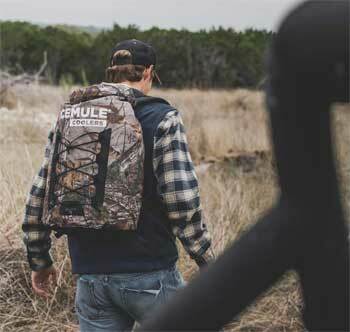 Overall, Icemule has made a high-quality, sturdy cooler backpack. If you need a rugged cooler that you can wear on your back AND have it keep your drinks/food cold for a long time, you will like this pack. 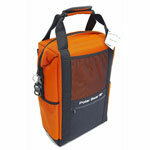 Also, if you prefer a zip-open lid rather than a roll-down top, take a look at the Polar Bear Backpack Cooler. It can also keep your stuff cold for 24 hours.